Cauliflower is a descendant of the common cabbage. It’s is a cool season biennial crop which is grown as an annual. It was developed in Italy and later spread to central and northern Europe and, North America. Cauliflower adapted to hot humid tropical climate evolved in India in the last 200 years, and improved tropical varieties are now cultivated in Japan, China and India. The Major producers of cauliflower are China, India, Europe, North America, Middle East, Japan and North Africa. In Africa, cauliflower and broccoli are only grown as minor crops sold in the major cities. In the US, California and New York are the major producers. 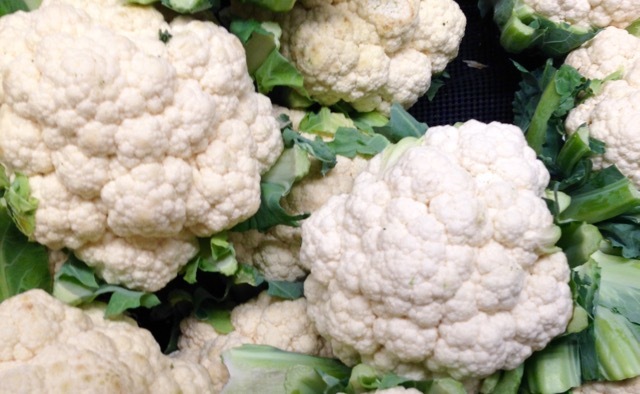 Cauliflower is grown for the large compact head of underdeveloped white flower buds.The compact head is also known as the “curd” White cauliflower is the most common but purple, orange and green types also occur. Green cauliflower, of the B. oleracea botrytis group, is sometimes called broccoflower.The cauliflower head grows on a single stalk, surrounded by heavily ribbed green leaves that protect it from sunlight so that the flower buds don’t develop chlorophyll. Exposure of the head to sunlight would discolour the florets and also cause them to develop an undesirable flavour. Cauliflower heads are cut with sufficient trimmed leaves still attached to protect the florets during packing and transport. They are usually wrapped in perforated plastic wrap to allow carbon dioxide to escape. A build up of carbon dioxide will discolour the white florets and they will taste unpleasant when cooked. Cauliflower is available all year round, but more abundant in autumn. 100 grams (3.5oz) of raw white cauliflower provides 120% of daily recommended vitamin C, has only 25 calories and zero cholesterol. It is also low in fat, has carbohydrates, a substantial amount of dietary fibre, potassium and B-vitamins, and some protein. Orange cauliflower contains 25% more vitamin A than white varieties. Cauliflower can be roasted, boiled, steamed, blanched, fried, pickled, or eaten raw. Before cooking, the outer leaves and thick stalks are removed, leaving only the florets. The leaves are also edible, but are most often discarded. When cooking cauliflower, add milk or lemon juice to maintain whiteness. The florets are mostly consumed as a cooked vegetable, but can also be eaten raw, in salads or with dips. Cauliflower is excellent for stir fries. They are also popularly sold as quick frozen vegetables in Europe and North America as part of mixed vegetables or on their own. The size of the head does not affect the quality of the cauliflower. Choose clean, firm, compact heads that are white or creamy white. The leaves surrounding the head should be green and crisp. Avoid heads with major spots, speckles, bruises or loose open flower clusters. Small leaves growing between florets are not a sign of poor quality, just pull them out before you cook the cauliflower. A medium-sized head of 6 inches diameter weighs about 1kg (2.2Ib) and serves 4-6 people. Trim off the leaves and stem. Cut the florets into equal sizes for even cooking. Refrigerate cauliflower in the crisper for up to 5 days, but it’s better eaten fresh. Keep unwrapped heads in an open perforated plastic bag. Always keep it, stem side up to prevent moisture from collecting on top. Pre-cut florets do not keep well. Avoid freezing cauliflower. Frozen cauliflower will look and taste watery no matter how you cook it. Commercially, cauliflower can be stored 3 weeks at 1ºC and over 95% relative humidity. Next What is Adzuki Bean? We’ve got cauliflower coming out of our ears from our CSA share. Roasted in a pasta with capers and toasted almonds–who knew? Fantastic! Roasted cauliflower is so flavourful. I love the crunch of almonds. Happy week to you! Made the potato salad look alike and everyone loved it! Checked out your recipe and will try the next time. I hope your enjoyed it. Happy trying! I am a great fan of cauliflower. It’s so easy to use in so many different ways. I have a recipe just love for potato salad, minus the potatoes, substituting cauliflower instead. Did I ever send that to you Liz? It sure cuts down on the calories and honestly, people can’t tell the difference! Hope your week is going well! What a great idea! Enjoy your day!